Okay, so the title of this post is a little misleading because… these two are actually already married! Aaron and Taylor booked us as their wedding photographers a few months ago and then out of the blue one morning, we received an email saying that they had an itch and just up and went and got married! So now, their Loch Raven Reservoir engagement session is a newly married session and their “wedding” in 2018 is going to be a vow renewal! This is the kind of love we’re talking about, y’all. The kind that you just can’t wait to be married for a year to up to the courthouse and sign the papers just because. The kind where you’re sitting on a tree trunk by a reservoir in the middle of your “just married” session (because your crazy wedding photographer told you to) and you decide right then and there, totally out of the blue, that you both want Chinese for dinner. That’s the kind of love we all want. Thanks for making us laugh a ton last night – we can’t wait for your next portrait session 😉 and your vow renewal celebration next year! 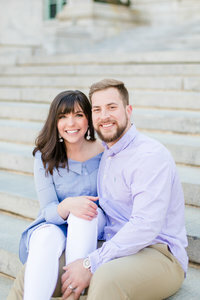 Click below to see more of our favorite recent engagement sessions!